It’s that time of year to roll up your sleeves and get ready to fill your kitchen and home with the aroma of Christmas baking! The smell of cinnamon, cloves, cardamom, fennel seed and star anise are what remind me most of Christmas because they are the smells, along with staple ingredients like nuts and butter, that I grew up with in my home of southern Germany. And those traditional German baked goodies are the ones I’m forever biased towards come Christmastime. Today I have another traditional German cookie to add to your repertoire of holiday baking: Zimtsterne. Have you tried these before? You can find them in any grocery store and Christmas market throughout Germany as well as in Austria and Switzerland. Christmas simply isn’t Christmas without them. And of course, as with most things, homemade is the best. These German “cinnamon star” cookies are made almost entirely of ground nuts – traditionally almonds but also commonly combined with hazelnuts. 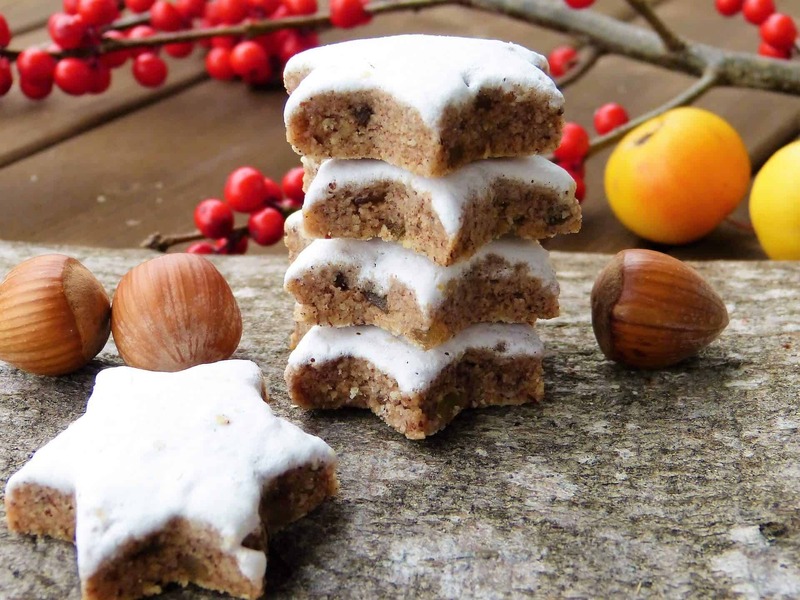 A southern German specialty, they are naturally gluten free and dairy free and feature a snowy white hard frosting made from sugar and egg white. An ingredient this recipe calls for that you may not be familiar with is Vanillezucker (vanilla sugar). It’s commonly called for in a lot of German recipes. Why no American manufacturer makes I’ll never understand – sometimes in baking you need that touch of vanilla flavor without adding any liquid (i.e. vanilla extract). That’s where vanilla sugar comes in. Other than that, these cookies call for just a small handful of ingredients, but I promise you, they really pack a wonderful flavor and texture. 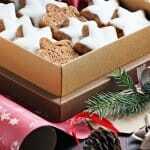 Zimtsterne are one of the most popular and beloved of all German Christmas cookies. And once you’ve tried them you’ll see why. Happy baking and may you enjoy this Most Wonderful Time of the Year! Beat the egg whites until peaks form (be careful not to over-beat or the frosting won’t turn out right). 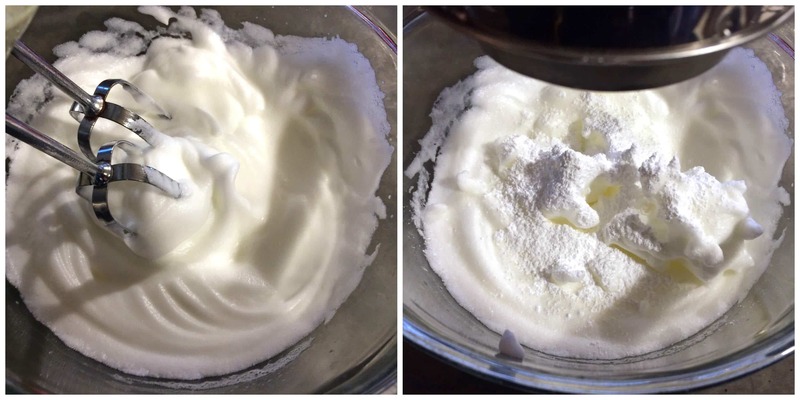 Sift the powdered sugar into the egg whites and use a spoon to stir just until combined. Reserve 2 heaping tablespoons of the egg mixture in a small bowl for the frosting. Add the nuts, cinnamon and vanilla sugar. Beat until the mixture is combined and comes together in a fairly stiff but pliable mass. If it’s too soft to work with add a few more ground nuts and powdered sugar. Press the dough onto a non-stick surface (you can sprinkle the surface with powdered sugar but I still prefer to spread the dough out onto either plastic wrap or a non-stick cookie sheet to prevent sticking). Press/roll it to a width of about a 1/3 inch. 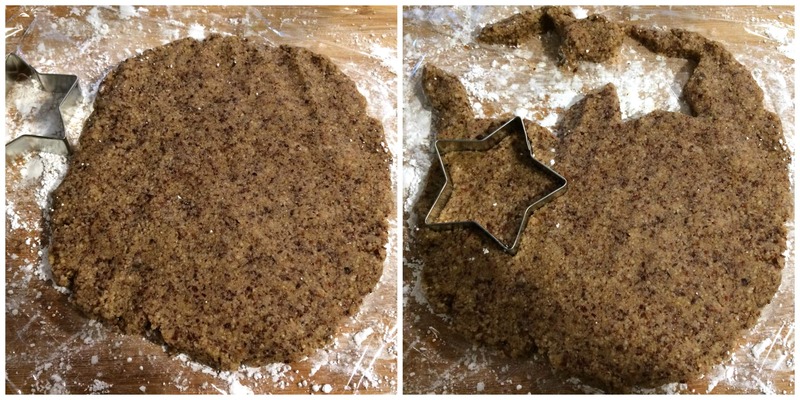 Use a 3-inch star-shaped cookie cutter and cut stars out of the dough. Knead the scraps back into a ball, roll it out again and cut more stars. Transfer the cookies to a non-stick or lined cookie sheet. Use a pastry brush to brush on the egg white mixture all the way to the edges of the cookies. Bake on the bottom rack in an oven preheated to 300 degrees F for 15-20 minutes. Let the cookies cool completely. Can be stored in a dry, airtight container in a cool place for at least 2 weeks. You'll fall in love with these famous German cookies! Preheat the oven to 300 degrees F (do not turn on the fan, it can cause the egg white topping to brown before the cookies are done). Place the rack on the bottom rung of the oven. Beat the egg whites in a medium-sized bowl until stiff peaks form. Stir in the powdered sugar until combined. Reserve 2 generous, heaping tablespoons of the egg white mixture for the glaze. Add the nuts, cinnamon, vanilla sugar and salt and beat until the dough comes together in a fairly stiff but pliable mass. If it's too soft to work with add a few more ground nuts and powdered sugar. Press/roll the dough onto a non-stick surface sprinkled with powdered sugar to a thickness of about 1/3 inch. 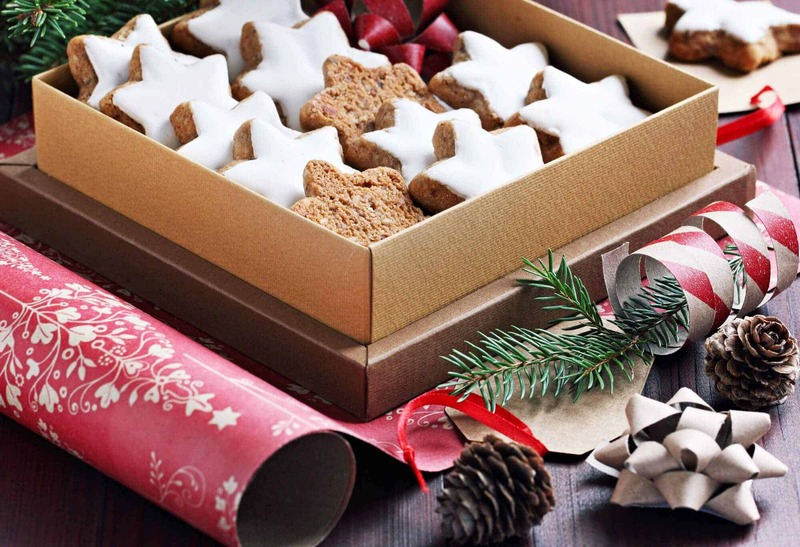 Use a 3-inch star cookie cutter to cut out the cookies and transfer them to a lined or non-stick cookie sheet. Form the scraps of dough into a ball, roll it out again and cut cookies out of the remaining dough. Use a pastry brush to brush on the reserved egg white mixture in a thin layer reserving enough for all of the cookies and extending the glaze out to the edges of the cookies. Bake for 15-20 minutes. Let the cookies cool completely. 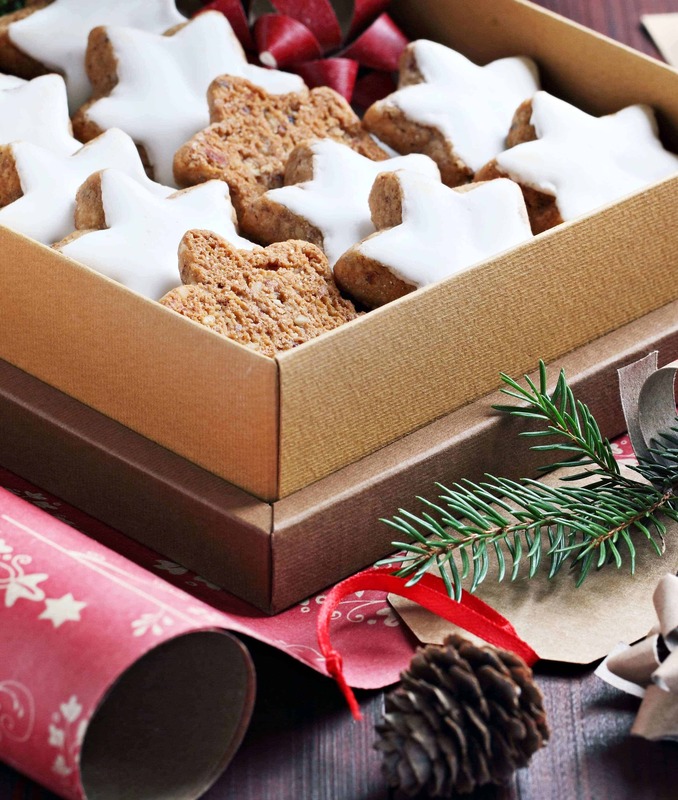 The cookies can be stored in a dry, airtight container in a cool place for at least 2 weeks. I’m loving these cookies!!! I’m so in the Christmas spirit this year and I’m definitely ready to do some baking! I’m SO ready for Christmas baking! These are going on my list! These are so fantastic and so holiday ready! Those cookies look awesome! Thanks for all the tips and hints on how to make them. Very helpful! I just put vanilla beans in my sugar canister. I figure there is NEVER anything made with sugar that won’t be improved by it. Thank you for sharing this recipe. I have all the ingredients and can’t wait to make these this year. Print! We used to have these kind of cookies around all of the time for the holidays I just didn’t know what they were called! I need to give them a try! I love the way you layered them in the box! I absolutely adore zimtsterne cookies and they’re always a treat at Christmas time. Now I want to make a batch for my family! These look really good, I make and always have vanilla sugar, your recipe calls for one packet, but what is the conversion for either weight or cup size? That’s a great question, Sue, thanks for asking. A packet of Vanillezucker typically has 8.2 grams in it and that’s just a tad over 2 teaspoons. You can purchase vanilla sugar at Ikea or any German deli. Thanks for the tip, MayBritt, I wasn’t aware that Ikea sells it. 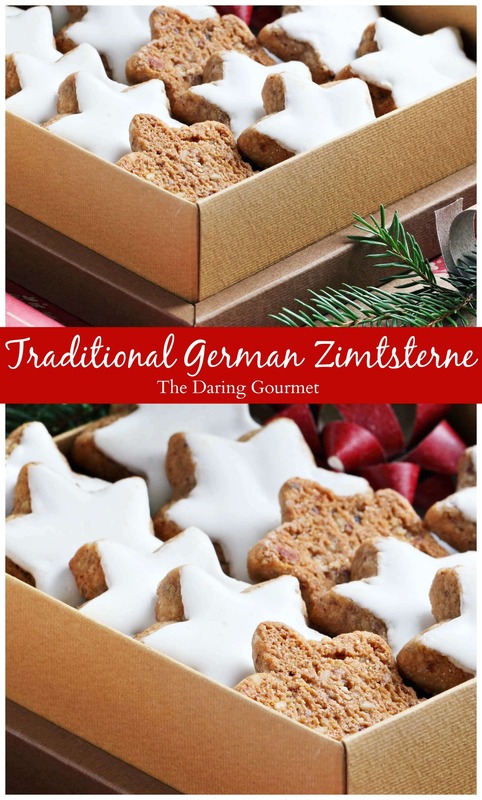 Zimtsterne are so delicious, I cannot wait to try your recipe! My parents used to buy these from the European deli, but I’ve never made them. Love how simple they are, and my kids would definitely love them! I want to make a ton of these and box them up as Christmas gifts!! Also, all of the photos in this posts are beautiful! 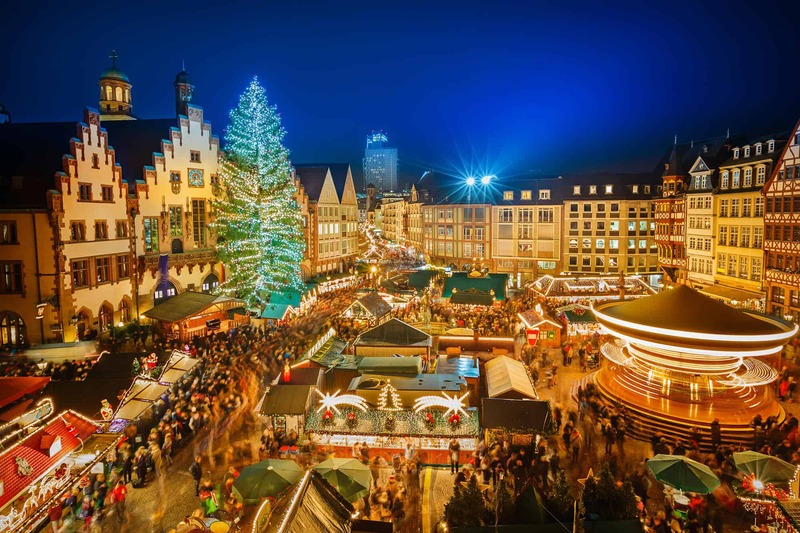 The Christmas Market is one of the things I cannot wait to make it to. Simply stunning. I love these! The was you layered them is perfect for a great gift! Wonderful, Alejandra! Happy baking and Christmas greetings to Guatemala! Hi Kimberly, I taught school with your mother in law at Val Vista Lakes in Gilbert. I have been following your blog & just made the French lentil soup for dinner. It was easy, fast, & delicious! Keep up the good work! Thanks so much, Maggie :) If the cookie dough seems too wet to handle or cut, just add some extra nuts and powdered sugar to it until it’s more manageable. Just watch, this will be your lucky year for making Zimtsterne :) Happy baking and let us know how it goes! Grretings again from Norway! 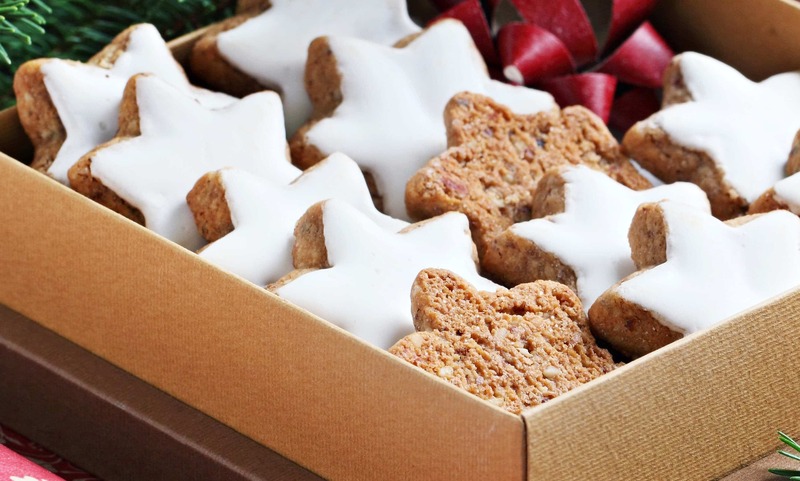 Love that you have posted this recipe- I have been making Zimtsterne using an old German recipe, but I’m thinking about trying yours this year as I’ve always experienced the biscuits being undercooked owing to having to take them out the oven in time before the white icing takes on any colour. Did you have the same problem here? Also, do you recommend leaving the biscuits to ‘dry’ overnight/24 hours before baking, which is how I typically make them? Thanks! P.S. I made your lebkuchen spice mix last night, and will be making the pfeffernüsse and elisenlebkuchen this weekend. I have a great German cookbook called ‘Ich helf’ dir kochen’, but now your blog has become my go-to for Weihnachtsplätzchen! 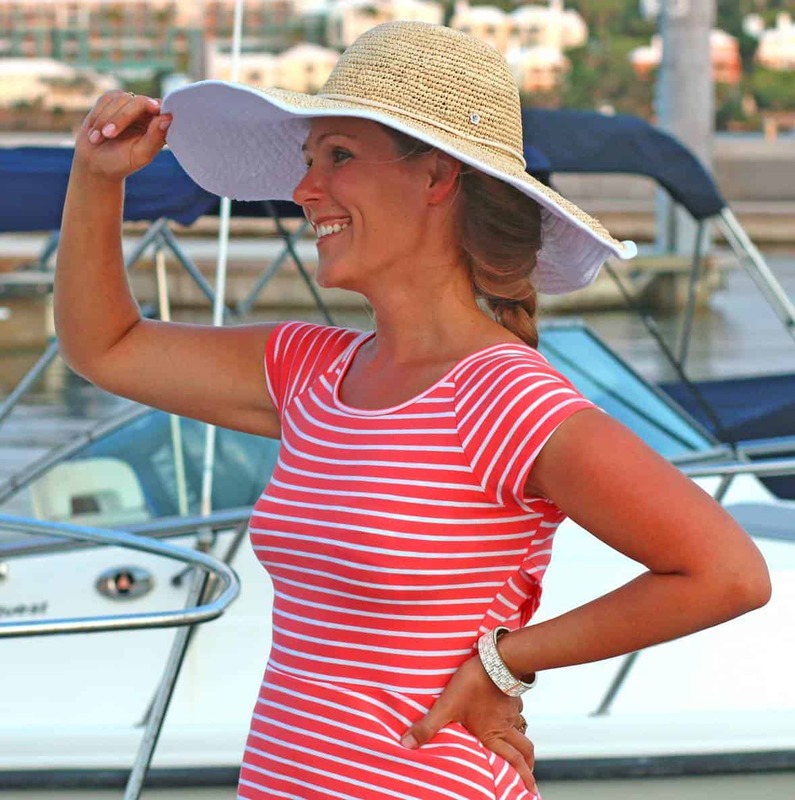 Hi Katie, it’s great to hear from you again and thank you! :) The biscuits being undercooked – what are you basing that on? Do they fall apart? The egg white in the cookies cooks very quickly so it’s not very likely that they’re actually undercooked. Drying the biscuits before baking them: I’ve heard of that but haven’t tried it. I’m not sure what the advantage would be but perhaps it yields a better texture? I’m not sure. Have you tried it both ways and compared? Complete disaster making these. Was not enough frosting in the reserved two tablespoons and as with a previous commenter, it turned brown after ten minutes. Oven on 150C fan. Biscuit dough was much lighter too, so overall… Bad day at the office. Hi Chrus, I’m sorry to hear it was a disaster. The “frosting” is applied with a pastry brush, so more of a glaze, and just enough so there’s enough for all the cookies. I’ll add a note in the recipe to emphasize that – it’s not smeared on in a thick layer like American frosted cookies. It’s a thin layer that hardens when baked. The biscuit dough is not supposed to darken. The glaze turning brown after 10 minutes is baffling to me. Did you have the rack positioned on the very bottom of the oven? I just read something and think I know what the problem is: It’s the fan. I just read in a forum that if you have the fan on (I never use it) it will turn the egg white brown before the cookies are ready. So the rack should be on the bottom of the oven and no fan. I’m going to add that note to the recipe as well in case anyone else uses the fan. I couldn’t even get my name right either! It’s Chris. Interesting about the fan, I’ll definitely have another go, if it wasn’t my mistake. And by brown, I meant the dough itself before cooking, mine was a lot lighter. Don’t get me wrong though, the finished product was more like a macaron with a chewy crispy frosting so from a taste perspective they were fantastic, just not the cookie I was hoping for. I only lightly smeared the frosting too, like in the photos, I just must not have reserved enough. Thanks for your quick reply and potential fix! I figured it was probably a typo (“Chrus”) but you never know, so I didn’t want to make any assumptions! :) I hope it works out better the next time. I’m not sure if you’ve had Zimtsterne before, I’m assuming you probably have, but their texture is unlike any typical flour-based cookie. They’re quite dense and crumbly-chewy. Wonderful, Chris not Chrus! :) I’m crossing my fingers your Pfeffernüsse turn out. I just made another batch and we’ve been enjoying those. I also just made some Mandel-Marzipanhörnchen which I’ll be posting here soon. Greetings to Manchester! I lived for 7 years just outside Peterborough and my husband spent a few months in Manchester, which I’ve also visited many times. We are both very homesick for England and are hoping to take our kids there next year. Excellent. Unfortunately we don’t get the lovely crisp cold Bavarian weather that really makes it Christmassy when you visit Germany; it’s just rainy! I was fortunate to be in Munich every December for 8 years with work. Loved it. Will look out for your new recipe, sounds intriguing. BTW, it was me who made your Coconut Chicken Balti last year for Christmas dinner 😁 Doing something similar this time too! Thanks. Oh yes, I remember! Hey, it has all the Christmas colors, doesn’t it? Red tomatoes, green cilantro, white coconut :) We all voted for something German for this Christmas so we’re making Sauerbraten and homemade Semmelknödel. Rain, yes. Living in the greater Seattle area now I can relate! I’m also terribly homesick for Germany (Europe at large really), especially during the Christmas season, but we had such a particularly wonderful 7 years in England and we miss it greatly. In terms of the most beautiful area of Germany, Bavaria is it and that’s wonderful that you were able to travel there so frequently. It’s hands down my favorite area of the country. Merry Christmas! The exact same thing happened to me. I don’t have a fan to turn off, so I don’t know what’s up. Mine are also extremely pale with a “tannish” icing. I’m not sure how to solve that. I believe they taste how they’re supposed to as they’re a meringue so they’re a bit chewy, and the icing doesn’t taste burnt, they’re just pretty hideous. Close your eyes while eating? That’s terrific, Cori, I’m so happy to hear that – thank you! Would the ground almonds be the same as Bobs Red Mill Almound Flour? Yes, Mark, exactly. 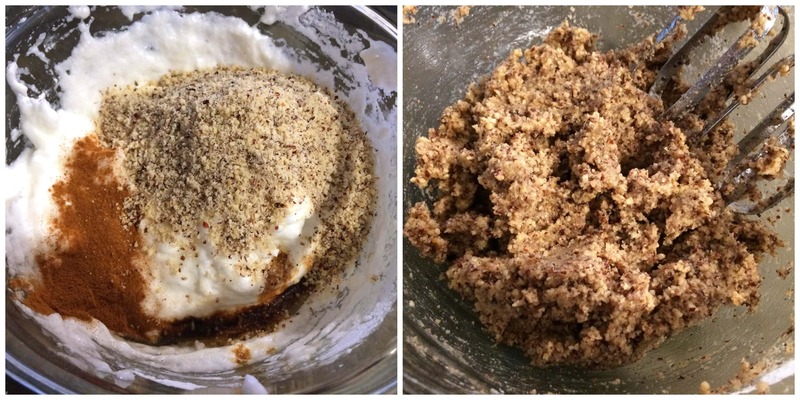 Finely ground almonds and almond meal are identical. I wonder if these cookies are moist and chewy inside or crisp? Hi Susan, they’re chewy – not at all hard or crisp. DELICIOUS! I haven’t had these in years and have only ever had the store bought ones. There are only two cookies left from the batch and I’m getting ready to make another :) Thank you! I’m so happy to hear that, Katherine, thank you! I just tried to make your recipe, and was really disappointed at how runny the mixture was. I looked at various other recipes to compare, and noticed that most suggest using 2 egg whites instead of 3. Hope they still taste great – they’re still in the oven! Hi Dominique – runny? I’m assuming the dough must have been stiff enough for you to cut out stars if they’re baking in the oven? I had to add a lot of flour to stiffen the dough, so not sure how they’ll taste. No one else has reported having had that issue and it is very odd. As long as by “flour” you mean you added more almond meal, that should be just fine. just wanted to check whether it’s ok to use almond or hazelnut meal from the supermarket? Or do I need to ground the nuts myself to have bigger “bits”? Hi Olga, yes the store-bought almond and hazelnut meal are perfect and that’s what I use. You want finely ground meal for this, not bigger bits. I generally recommend store-bought over grinding it yourself because the bought stuff is properly dried out. In grinding it yourself there’s a very high oil content in the ground nuts that can throw off the recipe. So unless you have the time to properly dry your own ground nuts, store-bought is the best way to go. Happy baking! I was just reading through your post again about the German cookies and saw your comment about American manufacturers not making vanilla sugar. Penzeys spices has vanilla sugar. I’ve purchase some years ago. You can find them online plus they have brick and mortar stores throughout the US. Penzeys.com :-) They have great quality spices. Hi Linda, that’s great to know, thanks for the tip! Zimtsterne are some of my favorite cookies and they turned out DELICIOUS! Fantastic flavor and texture, thank you! Hi! I made these & they are delicious,but my icing turned brown too. We had them at a German Christmas market so I wanted to try them. Hi Diane, I’m glad you enjoyed them! Once the egg white frosting begins to turn color it happens very quickly – it’s just a matter of keeping an eye on it. Followed this recipe exactly and they were absolutely delicious, the smell and flavor are heavenly! I followed this recipe with a couple adjustments. I doubled the recipe but only used 1 lb of powdered sugar (about 1/2 cup loss but they were still sweet). Reserved a bit more than 2 hefty spoonfuls of the egg-white/sugar mixture since I seemed to never have enough for glazing. The first time I made them, the glazing was sticky like a marshmallow but with practice, they’re more like a glaze now. I had to use blanched almond flour since I couldn’t find non-blanched but I was able to order the Vanillezucker off of Amazon. Added about half a teaspoon of baking powder for a bit of rise. Mixed the dry ingredients first before adding the egg-white/sugar mixture. Used a stocking shaped cookie cutter because all the star ones were bought out. Baked for no more than 15 min. Thanks for the feedback, Stacy! How do these turn out if I make the dough and set in fridge overnight like I do with my gingerbread dough? I find this makes for a better gingerbread cookie. Zimptsterne have been a long time tradition in my family but I have never tried to make them before. My mother sends them to me every Christmas in a parcel and I love them. Hi Herb, greetings to Alberta! Absolutely, the dough can be made well in advance and refrigerated. I hope you enjoy them – Happy baking! These cookies are my everest. I cannot get the icing not to brown. I live in an apartment and don’t have the best oven, so maybe things will improve when that changes. I made 8 of your cookies this year (alone). I’m pretty exhausted, but happy! On to stollen! Hi, there’s really no right or wrong, it just comes down to personal preference. Neither kirsch, lemon or orange are “traditional” to Zimtsterne but that doesn’t mean you can’t add them. I personally don’t care for kirsch, but I agree that a little citrus zest would add a nice flavor dimension. These cookies are crazy delicious! Everyone always raves about them. Thank you for the recipe! These are so cute and delicious! I made them for my husband’s office and they loved it! What a cute little star cookie! I love the flavor of all the spices in these holiday cookies!!! These are so pretty and festive for the season! Baking Zimtsterne is a tradition in our household at Christmas. This year we will be trying your recipe. We’d like to make half the batch “adult” versions and add a splash of kirsche liquor. Do you think this would work? Would it be a matter of also adding more nuts/powdered sugar to get the correct consistency afterwards? Hi Ceilidh, you bet. As long as it’s just a splash that shouldn’t alter the texture enough to make a difference. But if you find the dough seems a little too wet then yes, just add a few more nuts. Happy baking! This year we are also making your Marzipan & Fleischsalat! Its a Daring Gourmet Christmas in our household! LOL, Ceilidh! :) Merry Christmas! So I just finished making these and they are amazing! This recipe works perfectly. I admit I was a bit intimidated by the idea of these and they were somewhat challenging, but the rewards (getting to eat them) are totally worth it. I made a double recipe, one traditional and one with a little orange zest. Love them both. Thanks Kimberly, I have a new cookie tradition! Awesome, I’m so glad you enjoyed them and really appreciate the feedback, thank you! I’ve made two separate batches of these this year but both came out (baked) a different texture than my husband and sister-in-law remember their mom’s being. The flavor and texture are perfect for my taste (although I do tend to frost mine a little heavier because I like the meringue) but I’m curious, never having had them before, what exactly the texture should be. Mine are crispy/chewy but hubby remembers them being more delicate and crumbly like “melt in your mouth”. Am I doing something wrong or is it just a lapse in his memory, LOL???? I’ve made these cookies twice now, and both have turned out wonderfully. Your instructions are really helpful, and for anyone reading this I recommend reading the entire recipe thoroughly before starting. Both times the dough came together really well for me, and rolling it out was pretty easy. I followed your recommendation to use the bottom rack of the oven and baked mine for 12 minutes, and the egg whites did not brown and the cookies have a lovely chewy consistency. I love this recipe and these cookies! Fantastic, Allison, I’m thrilled to hear that and appreciate your feedback, thank you! HOLY COW THESE ARE AWESOME!!! After a diagnosis of Celiac last year I had pretty much given up on cookies but then I wanted to make cut-out cookies for our family Hanukkah party so off I went searching the internet and found these. They are AMAZING!! I didn’t have the vanilla sugar (will be ordering it now that I know how awesome this recipe is) so I used 1t of vanilla extract and upped my almond flour to 3.5c. I also used blanched almond flour because it’s what I keep on hand. Thank you so much for sharing this! A definite keeper for me. I’m so glad you enjoyed them, Janice, thanks so much!